AUSTIN, Texas – Texas Gov. 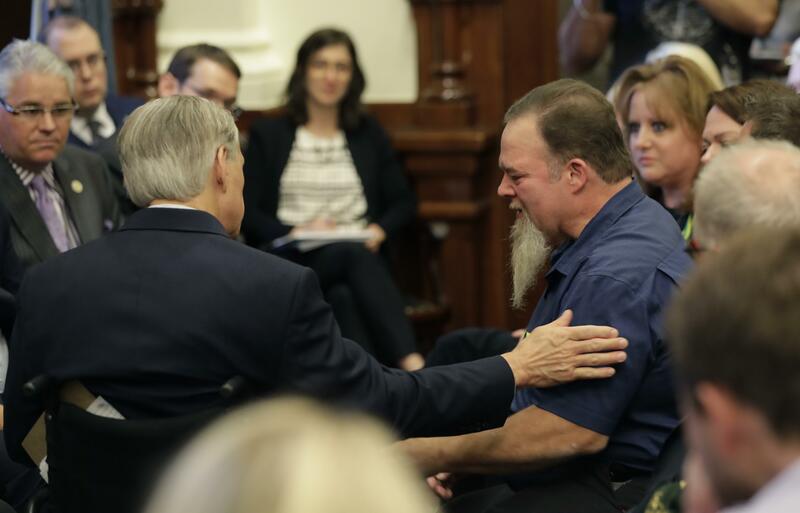 Greg Abbott wrapped up three days of emotional meetings on school safety and mass shootings Thursday by speaking with survivors from last week’s shooting at a high school near Houston. But there’s little expectation that the staunch gun-rights supporter will push for major changes to restrict the ownership or purchasing of firearms. The Republican, who is campaigning for re-election, organized the mostly closed-door meetings shortly after eight students and two substitute teachers were fatally shot last week inside Santa Fe High School. Abbott said he wanted to find “swift and meaningful” ways to stop future shootings. Abbott so far has ignored calls from a handful of state lawmakers from both parties to call the Legislature into special session to address gun laws, which is a sharp contrast to the response in Florida after a high school shooting in February killed 17 people. Three weeks after that massacre, Florida politicians, who were already in session, passed a gun-control package after a lobbying campaign led by student survivors of the attack. Lawmakers aren’t scheduled to meet until January 2019 in Texas, a state that embraces its gun-friendly reputation and has more than 1.2 million people licensed to carry handguns. And unlike the students in Florida, several students at Santa Fe High School have been vocal opponents of increased gun control, including some of those who were invited to meet Abbott on Thursday. The only tweaks to gun safety Abbott mentioned as possibilities this week were stronger laws on gun storage and reporting of lost or stolen weapons, and quicker reporting to law enforcement when a court order denies someone access to a gun. Several of the families who met with him Thursday said they didn’t want to talk about new gun restrictions or the politics of gun rights. This week’s meetings included representatives of both gun rights and gun control groups. However, Alice Tripp, legislative director of the Texas Rifle Association, an affiliate of the NRA, said her group found “no common ground” on gun restrictions and would be cautious of anything that would deny access to buy or own guns. Thursday’s meeting lasted more than three hours and included more than 30 students, families and staff members from Santa Fe High School, as well as two survivors of the November church shooting in rural Sutherland Springs, Texas, that left more than two dozen people dead. Stephen Willeford, the church neighbor and former NRA gun instructor who was hailed as a hero for grabbing a rifle and firing back at the attacker, also attended the meeting. The issues that seemed to get most of Abbott’s attention this week – better security, tracking student mental health and school counseling – would cost money, and the state’s public schools are already living under strained budgets. While most of the week’s meetings were closed to the public, media was allowed in for about two hours of conversation between the governor and the students and families. Johnson noted her government class wrote to Abbott’s office after Santa Fe High School had a three-hour lockdown in February because of a false shooting alarm. An Abbott spokeswoman would not confirm if those letters were received. The Texas State Teachers Association has resisted calls by the state’s top Republicans for more teachers carrying guns. “If they are serious about making schools more secure, they need to quit talking about arming teachers and start appropriating the state funds necessary to hire more campus police and install more security safeguards in school buildings,” including metal detectors, Clay Robison, spokesman for the Texas State Teachers Association, said this week. Texas Democrats urged Abbott to address gun issues. Rhonda Hart, a military veteran whose daughter Kimberly Vaughan was killed in the Santa Fe shooting, has been outspoken this week on the need for more gun control. She wasn’t invited to the meetings this week. “You should have to wait a week, have counseling and walk through lines of protesters who tell you you’re a murderer” to buy a gun, Hart said. Published: May 24, 2018, 5:55 p.m.